The old street plan of the city can still be appreciated, with fine exemples of historic buildings and monuments built after the earthquakes of 1427 and 1428. Tourist Information Office. Carrer Francesc Fàbrega 2-6. Tel. 972 26 01 41. Winter opening hours: Monday to Friday 09.00-14.00 and 17.00-19.00; Saturdays 10.00-14.00 and 17.00-19.00; Sundays and public holidays 11.00-14.00. Summer opening times: ask in tourist office. Museu de la Garrotxa. Tel. 972 27 91 30. Hours: Weekdays 10-13h and 15-18, Saturdays 10-14h and 16-19h. 11-14h Sundays and holidays. Monday closed. Exhibitions on local history and art from the end of the 18th to the mid-20th centuries. Churches of La Mare de Déu del Tura and Sant Esteve of different styles dating from Middle Ages to the 16th century. Renaissance cloisters of El Carme dating from the late 16th century. Parochial Museum with El Greco's Christ Embracing the Cross (only by appointment by calling 972 26 04 74). Art Nouveau buildings itinerary. Casa-Museu Trincheria. Tel. 972 27 27 77. Hours workinh 10-13h and 17-20h. Saturdays and Sundays 11-14h and 17-20h. Monday closed. Museu dels Sants (1891 neo-Gothic building, archiect Joaquim Codina). Working days 10-13h and 15h-18h, Saturdays 10-14h and 16-19h. 11-14h Sundays and holidays. Closed on Monday. 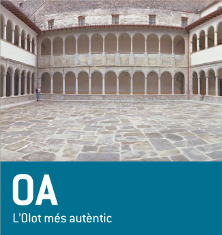 Access: The old town of Olot is easily reached from the car parks near the city centre.